Staples' Hannah DeBalsi competes in the girls 3200 meter run at the CIAC Class LL Connecticut Outdoor Track & Field State Championship at Danbury High School in Danbury, Conn. Thursday, June 5, 2014. DeBalsi won the event with a time of 10:27.59. Staples won the girls overall championship and Ridgefield won the boys overall championship. Staples' Hannah DeBalsi competes in the girls 3200 meter run at the CIAC Class LL Connecticut Outdoor Track & Field State Championship at Danbury High School in Danbury, Conn. Thursday, June 5, 2014. MIDDLETOWN -- One last epic battle in track's staple event, the mile, was sure to take place on this early June afternoon. It was happening, rain or shine, because this event has for two years pitted the state's finest runners against each other, and like the end of slug-it-out seven-game basketball series, they needed a tantalizing finale. Except when Staples sophomore Hannah DeBalsi arrived at Danbury High five days ago for Class LLs, her coach told her, "It's over." "I was like, `What's over?" DeBalsi said at Monday's State Open. "And he said, `Claire's not racing.' I was sad because I want to race her again because she won both times, but I can't do anything about it now." Westhill senior Claire Howlett had fended off DeBalsi in what turned out to be their final dual, setting an FCIAC record with a blistering 4:48.19 in the 1600 at the league championship meet. She also had edged DeBalsi by seven seconds in the 3200. But Howlett wasn't running at the LLs. An IT band injury kept her out, the Norwalk Hour reported. And that meant DeBalsi would cruise in both events. It also meant Howlett wouldn't qualify for the State Open, which brought the two-year rivalry to a premature finish line. At Monday's State Open, DeBalsi predictably could have log-rolled or crab-walked the final lap of the 3200 and still won. She finished in 10:24.06, roughly four seconds off the meet record set by Howlett last summer, and the runner-up, Simsbury's Sarah Mattison, crossed at 10:44.46. Distance runners admit they typically run for themselves. It's about the time, not necessarily the competition. Yet distance runners also concede the importance of rivalries. And for DeBalsi, who has burst onto the scene as perhaps the most promising, impressive prospect in a wave of stud Connecticut distance runners, Howlett has always provided that push. As a kid, DeBalsi was a student of Tae Kwon Do. She played on baseball teams with her twin brother. She only ran on family vacations. When she joined cross country as a freshman, her coaches told her, "Stay with the girl from Westhill." DeBalsi didn't know who the girl was. "I just knew she was the girl in the purple uniform," DeBalsi said. DeBalsi took Howlett in the FCIACs last spring. Beat her in both the 1600 and 3200. 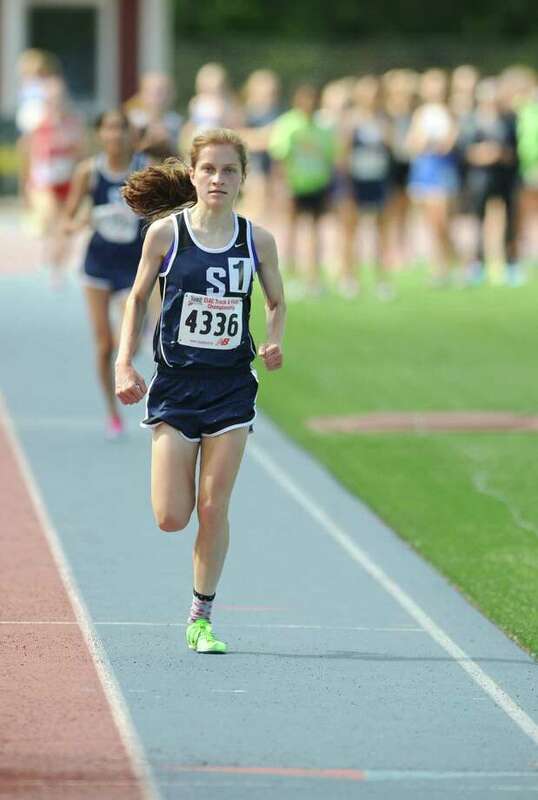 At the 2013 LLs, Howlett coasted past her rival by six seconds in the 3200. DeBalsi won by 0.6 in the 1600. Howlett swept the 2013 Open, a winner by 0.58 seconds in the 1600 and by nearly two seconds in the 3200. Both runners obliterated the previous State Open record, a mark of 10:35.02 set by Glastonbury's Lindsay Crevoiserat in 2012. DeBalsi checked in at 10:21.86; Howlett at 10:20.03. See what I mean about the rivalry? At last spring's Open meet, there was one other freshman who qualified for the 1600, Wilbur Cross' Danae Rivers. Unlike DeBalsi, she was a lifer in distance running. She started with the New Haven Age Group Track Club as an 8-year-old. Like most everyone, she was battling for third place when DeBalsi and Howlett stole the show. This spring, Howlett's injury hardly meant there would be no rivalry. Seeded third in the 1600, Danae Rivers jumped out in front of the pack, and she stayed there until DeBalsi, shorter and slimmer, casually made her pass at the 400-meter mark. DeBalsi held the lead, but Rivers never left her heels. "It was great to have her in the race, to have her pace and take that second lap," Rivers said. "It was like `OK, let me ride this out and see how this feels.' The pace was excellent." Said DeBalsi: "I knew if I was going to drop her, it would have to be on the third lap." The third lap was much like the second, though, and DeBalsi's lead neither stretched nor shrunk. She thought, "OK, (Rivers) is going to have a kick. Hopefully I'll have a kick, too." The race had gone according to plan for Rivers, who appeared relaxed throughout. She made her move with about 200 meters left. And with Rivers' kick, her strength, a comeback seemed a longshot. But as the two sophomores rounded the corner, rain crashing to the track and splashing up with each kick, DeBalsi reached deeper, finding a gear she'd needed in all those races with Howlett. Her form looked perfect. Rivers was flailing around the 50-meter mark. This, yes, would be an epic finish. Exhausting everything, Rivers remained a half-step ahead, if that. "I considered diving at the end," DeBalsi admitted, "but I probably would have crashed into her." DeBalsi stayed on her feet, Rivers kept churning, and from the stands, it was near-impossible to tell which time, both shattering a two-year-old State Open record, would hold. It then went final: Hannah DeBalsi, 4:47.50. It was the start of a brilliant afternoon for Rivers, who also won the 800 and the 4X400. It was a loss for DeBalsi, but nonetheless a personal record and a successful kick. "I got both of my goals," DeBalsi said. She also got a new rivalry, one that should push her, provide more thrills, and probably more records, in the years to come.